This week at Grand Rounds we are honoring health care professionals who serve their country by serving others. I want to thank Dr. Nick Genes for letting me host Grand Rounds this week, and I also want to thank everyone for all of their great submissions. The number of submissions that I received overwhelmed me, and I apologize that I didn't have room for every post. The artwork found in this week’s edition of Grand Rounds illustrates the history of military medicine, and the dedication of the men and women who care for patients in military medical facilities and outposts around the world. 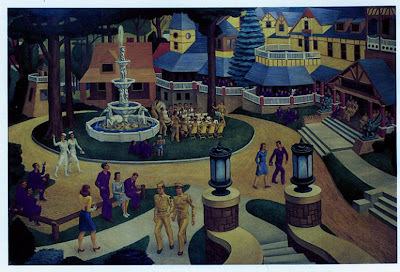 In the 1944 painting above by Jack McMillen, the artist depicts life at the Forest Glen annex of the Walter Reed Army Medical Center. The annex served as a holding and rehabilitation unit for medical patients, including psychiatric patients during World War II and in subsequent wars. "Long Binh," by David N. Fairrington. This week I want to spotlight three deeply moving posts. Sid Schwab from Surgeonsblog submitted this post about his wartime experiences while serving in Vietnam. His post describes how the Vietnam War affected his life and the lives his patients. He also talks about a young man from his local community that is accused of committing war atrocities while serving in Iraq. Sid bears witness to the simple reality that war destroys the human body, as well as the human soul. You will clearly understand why war is hell after you read Sid’s submission. 911 Doc from M.D.O.D reflects on a recent memorial service that he attended on a military base for several soldiers killed in action. He talks about heroism and the sacrifices that are being made by warriors who choose to serve their country. I want to welcome LTC Christopher Coppola, USAF, to Grand Rounds. He is a military doctor who is currently serving in Iraq. He is also the author of “Made a Difference for That One: A Surgeon’s Letters Home from Iraq.” Christopher tells readers why he joined the military and what it’s like serving our country during wartime. Chris, thank for your service to our country. 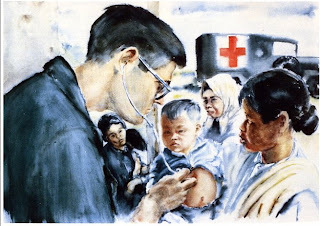 "American Doctor II--Field Force Doctor Examines Vietnamese Child," by Samuel E. Alexander. 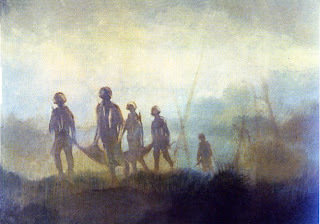 Samuel E. Alexander was a member of the U.S. Army Artist Program and was in Vietnam in 1967. 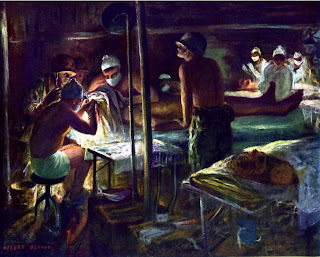 His painting depicts the other functions of U.S. Army Psychiatry in the theater of operations. When not evaluating and treating combat stress casualties, or providing consultation service to commanders, psychiatrists and other physicans routinely provide medical care to the local civilian poplation. Military nurses also provide care to local civilians. As part of her tour of duty, LCDR Tammy Swofford, USNR, NC cared for civilians in Accra, Ghana, West Africa. Read her post about what it is like to be a military nurse. "Killed in Action," by Burdell Moody. Burdell Moody starkly portrays a squad returning to base camp in Vietnam, carrying the body of one of their soldiers. Perhaps the most stressful aspect of combat for a soldier, other than pondering his own death, is the death of another, especially a member of his or her own unit. Witnessing death is a critical event in the life of any soldier and his unit, one warranting immediate debriefing to lessen the likelihood of developing post –traumatic symptoms in the future. Toni Brayer from EverythingHealth writes about a new organization that is developing a national network of mental health professionals that will provide free care for returning Iraq and Afghanistan vets and their families. I urge you to read her post to learn more about Give an Hour. Adam from NY Emergency Medicine writes a congratulatory note to Boston psychiatrist Jonathan Shay in his column, Shrinking the News. Dr. Shay received a MacArthur Foundation “genius award” for his pioneering work in using literary parallels from Homer's 'Iliad' and 'Odyssey' to treat combat trauma suffered by Vietnam veterans. Read about Dr. Shay’s work and how he is helping combat troops. 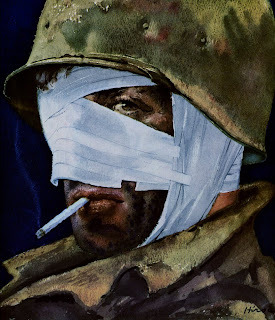 “Wounded Aboard,” by Lawrence Beall Smith. 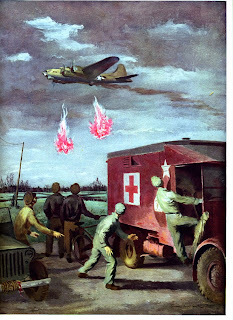 Doctors, Medical Corpsmen and ambulances were always present for the “sweating in” of the returning mission during Word War II. Coming in late in the day and often in the heavy weather, any ship in the group, which had wounded men aboard, would drop red flares. This was how they communicated their need for immediate medical assistance upon landing. The key to any successful military action is excellent communication within its ranks. Corporations also know the importance of good communication and are entering the blogosphere as a way of reaching out to consumers and health care professionals. Media relations team members, Marc Monseau and Rob Halper, are writers for Johnson and Johnson’s corporate blog, JNJ BTW. Both bloggers attended the Health 2.0 Conference, and submitted their impressions of the event. Jan Martens from MedBlog.nl sent in this overview of the Health 2.0 Conference. Check out his post and see video highlights of the event. Bertalan Meskó from ScienceRoll writes an open letter to the physicians of the world about why to use web 2.0's features in a medical practice. 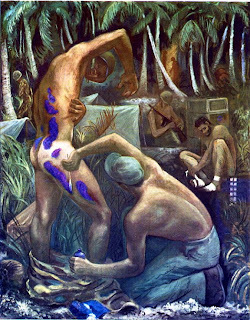 "Flashlight Surgery In Saipan," by Robert Benney. anesthesia is like going off to battle. Bongi from other things amanzi writes that surgery can be summed up in one sentence; “Eat when you can, sleep when you can and don't f#@k with the pancreas.” I’m sure military surgeons would agree with his assessment. Bongi gives readers advice on how to wake up after you indulge yourself in a quick nap. Here's something that will wake you up. GruntDoc sent in this post about how to make coffee. He said that Navy Docs like their coffee. "Night Vigil," by Robert Benney. 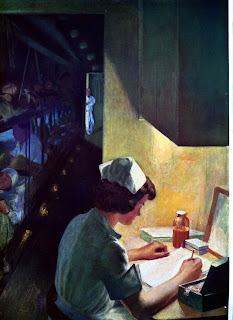 While the Hospital Train rolls through the lonely night, the Army nurse checks the patients’ charts. At the far end of the car, the medical aidman keeps an alert eye on his patients. Colonel Florence Blanchfield, the Superintendent of the Army Nurse Corps during World War II, said, “There’s no glamour about nursing. Every nurse (in the military) is a volunteer. She is nursing because she wants to. Unless you want to help others and make sacrifices, you have no right to be in nursing.” Nurses of today are no different than nurses of the past. They are mobilizing to improve the lives of their patients. Teri Mills from the National Nursing Organization supports the establishment of the Office of the National Nurse. Teri believes that nurses will volunteer to help improve health care in America. Nurses are working on other fronts to improve patient care. A group of West Coast nurses have declared war on greedy corporate hospitals. Kim from Emergiblog writes about an impending nursing strike in Northern California. Theses nurses are fighting and sacrificing for all nurses and for the patients we serve. ERnursey isn’t happy with how hospitals conduct marketing campaigns. Read her post about how using smoke and mirrors to draw in the wrong type of patients is hurting our health care system. "Purple Heart," by John O. Wehrle. 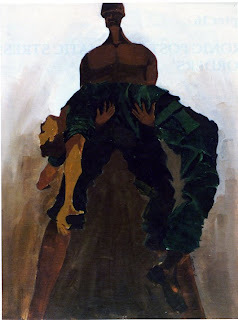 John O. Wehrle depicts a serviceman in Vietnam who has received his Purple Heart in a Surgical Intensive Care Unit. 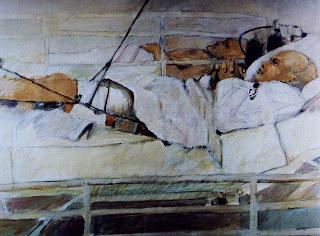 In combat settings, traumatic brain injury often occurs in conjunction with other injuries, as shown in the painting. How to Cope with Pain says that it's becoming increasingly apparent that chronic physical pain is a significant problem for a high percentage of men and women returning from combat. As the survival rate after injury improves because of better protection, the rate of development of chronic pain unfortunately increases also. This article is the first in a series reviewing types of medication that are helpful for chronic pain. Val Jones MD from revolutionhealth takes and interesting historical look at how war sadly advances the field of surgery, and was the primary cause for the birth of her own specialty, Physical Medicine & Rehabilitation. In her 2 part series on “What the Heck is a Rehab Doc?,” she talks about how the Civil War, World War I, and World War II resulted in the creation of a specialty to handle amputees and to help re-integrate people into the work force after life-altering physical and mental trauma. One of Dr. Jolie Bookspan's areas of injury research for the military involved finding ways of preventing back pain caused by running. Disease Non-Battle Injuries (DNBI) caused by exercising and physical therapy is a huge military issue. Read how she is helping people learn about healthful daily movement. “Pill Call,” by Franklin Boggs. Soldiers suffering from malaria during World War II received their daily quota of atabrine tablets from the Medical Corps captain. Atabrine was more effective than quinine, and was the army’s first line of defense against malaria. Pharmaceuticals save countless lives during times of war, and they are playing an increasingly important roll in our lives. David E. Williams fromHealth Business Blog sent in this post about the FDA. The agency is considering adding a formal category of drugs that would fit in between prescription and over the counter medications. 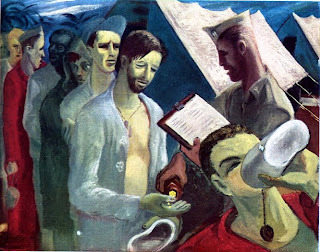 "Life-Giving Plasma," by Ernest Fiene. 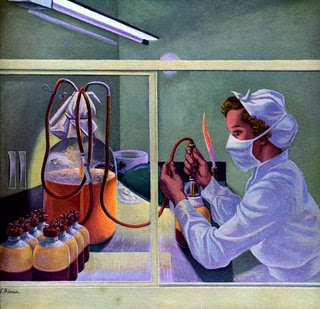 In 1945, Surgeon General Norman T. Kirk was asked to name the first three outstanding innovations brought about by World War II, and without hesitation he said, “Surgery, the sulfa drugs, and penicillin.” Other outstanding achievements in military research included dried plasma, which was developed and first used during World War II. Medical research conducted by the military during wartime continues to save countless lives. Research in the civilian world is also saving lives. Dr. Anonymous sent in this post about the American Cancer Society and Breast Cancer Awareness Month. One day researchers will find a cure for breast cancer, but until then Dr. Anonymous is urging readers to learn the facts about the disease. Emmy from the Pink Tee Shirt is a member of another type of army. She is one in an army of of volunteers who walk and run to raise money for cancer research. Read her story here. Advancements are being made in all areas of the health care arena. David Harlow from HealthBlawg writes about creative approaches to caring for seniors in less restrictive settings. The effort to improve the health of patients continues on other front as well. Christian from Med Journal Watch writes about how depression in women might be caused by the War on Obesity. "Jungle--Ally of the Enemy," by Franklin Boggs. The tropical jungles of the South Pacific seemly were on the side of the Japanese during World War II. These jungles were infested with malaria, and strange tropical fevers and skin diseases that had never been seen before by military doctors. When medics weren’t busy attending to wounded men, they moved around the jungle with a bottle of solution and swabs, checking the ravages of prevalent skin disease. Military doctors have always functioned as detectives to cure unknown illnesses that have plagued the troops. Philip from Past Lessons, Future Theories is a House, M.D. fan and he sent in a post about about a patient on the show who was suffering from Von Hippel-Lindau disease. Dr House can cure anything. He is a medical detective just like the doctors who served in the South Pacific. Other situations remain a mystery. Steve Sims, a contractor working in Iraq was shipped home because he has diabetes. Was he shipped home for political reasons? Read Diabetes Mine and find out what happened. Have you ever wondered what it’s like living with type 1 diabetes? Kerri Morrone from Six Until Me writes about her troubling low blood sugar that hit her in the wee hours of the morning. Here's another mystery. Does fat and meat impact prostate cancer?Gerald Pugliese from DiseaseProof.com is staying out of the fray, and invites you to voice your opinion. Do you want to know how to reduce your risk for asthma? Read this post from Allergy Notes. Mystery solved! “The High Visibility Wrap,” by Joseph Hirsch. I want to thank all the men and women who are serving in uniform, and those individuals who are taking care of wounded troops around the world. Your service is invaluable. You not only touch the lives of your patients, but you touch the lives of all of us as well. NY Emergency Medicine is hosting Grand Rounds next week. Great job with this! The text presentation and the pictures flow seamlessly. Excellent! One of the best, most internally consistent, themed Grand Rounds I've seen in some time. I love that old-timey feel your blog always brings to me. Wow! I absolutely love the paintings that accompany this GR. Excellent job, MJ!! Excellent style of writing, nice sections. Well done! Indeed excellent writing. I hope someday I will write as elegant as you. Thanks for including my post. excellent GR, my favourite one to date! It was such a pleasure to read and view this post! It conveyed such a depth and breadth of military medicine, across continents and history. It made me feel a link to brave hardworking men and women and made my row seem a little easier to hoe in comparison. Wow - this is an amazing group of post and beautifully done. Reading these posts sort of puts our day-to-day struggles and controversies into perspective. Fantastic Grand Rounds, well written and easy to read. Great job! well done! your images are powerful. Beautiful artwork seamlessly combined with a great presentation. Well done, and thanks for including me! Wow! Just want you to know I appreciate the extra effort that must have gone into rounding up all those amazing pictures. This post stunned me into silence. Sorry all, deleted original because of a typo. Anyway, onward: Brilliant, just brilliant GR! For another look at the art side, look up Henry Tonks, British surgeon and artist. During WW I did pastels of horrific wounds and repairs; for many years would not let them be seen in public to protect the identities and privacy of the patients; pioneered in the treatment of facial wounds while also recording them in his studies. Had a more public career of commissioned works, and as principal of the famed Slade Art School in London (which he headed while serving on the front in 1917). A pencil portrait of Tonks by his friend and colleague John Singer Sargent is a knock-out. great grand rounds. thanks for including me. here's a salute for my friends who are there or have been there or will go there. thanks to you all. Beautiful, powerful and insightful. God bless and keep those in harm's way and thank God for Medics, Corpsmen, Nurses, & Doc's. Would You Like Fries with Your E Coli?